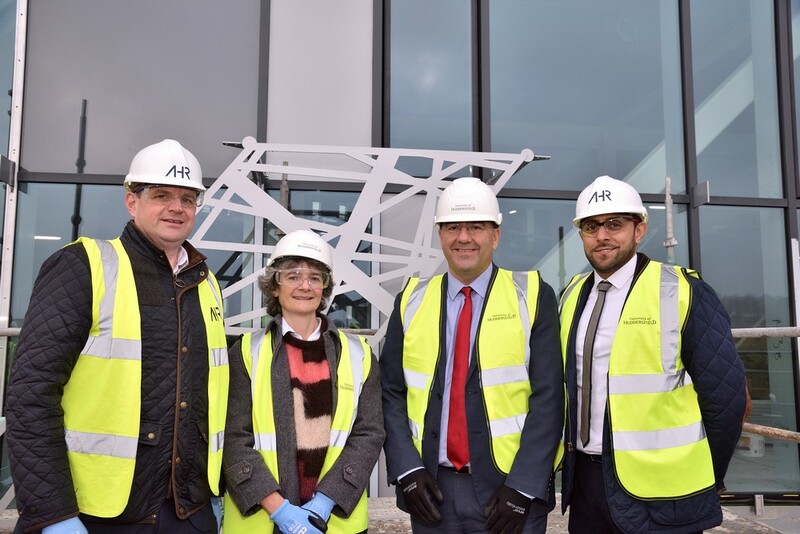 28th of November 2018 – As the five-storey, 7,500 square metre Barbara Hepworth Building takes shape, the University was pleased to welcome AHR’s Gurminder Sanghera and Andrew France and Dr Sophie Bowness, granddaughter of Wakefield sculptor Barbara Hepworth, to the ‘topping out’ ceremony. 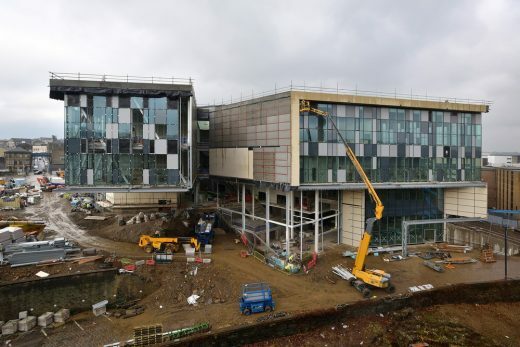 Construction of the University of Huddersfield’s new £30 million centre for the study of art, design and architecture is months ahead of schedule, and it has witnessed an unusual “topping out” ceremony conducted by the granddaughter of Dame Barbara Hepworth, the famous artist who has given the building its name. Dr Sophie Bowness – who is an art historian and a trustee of the world-famous Hepworth Gallery in Wakefield – was invited to turn a bolt on one of the 146 aluminium panels that will be fixed to the glazed walls of the new building. Their function will be to reduce solar glare, but architects AHR have ensured that they are also an artistic adornment. One of the great sculptors of the 20th century, Barbara Hepworth, who lived from 1903 to 1975, was born and educated in Wakefield. She was the first choice to be commemorated by the new University of Huddersfield building and at the topping out ceremony Vice-Chancellor Professor Bob Cryan thanked Dr Bowness for giving permission to use her grandmother’s name. The ceremony was attended by AHR’s Regional Director Gurminder Sanghera and Director Andrew France. 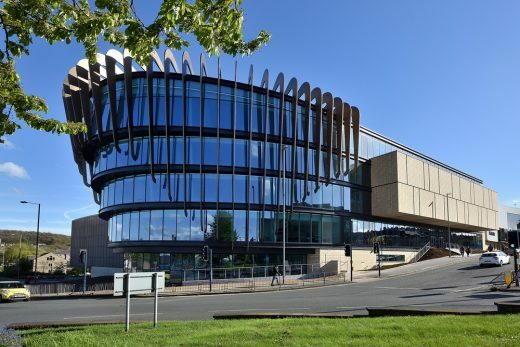 AHR were the architects behind the University’s £28 million Oastler Building, opened in 2017, which was announced as the Best Education Building at the West Yorkshire Local Authority Building Control Awards. 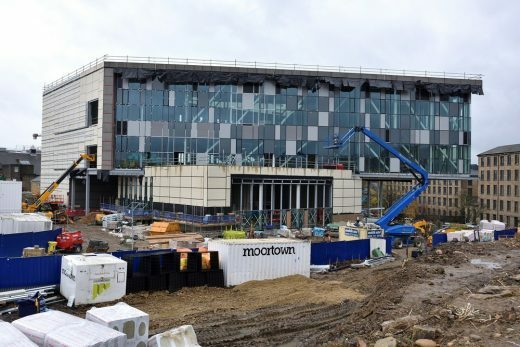 AHR Director and Education Sector Lead, Anthony Langan, said: “The University is investing heavily in its estate, creating world-class facilities for students and staff. 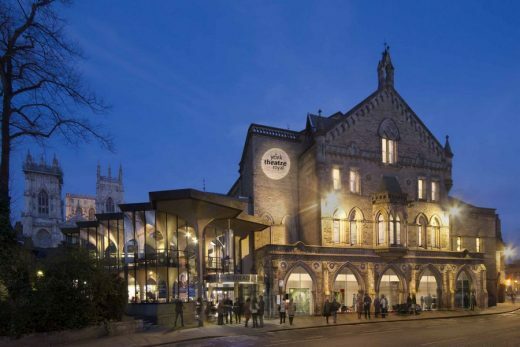 We are proud to once again be working with the University on another iconic building.